Winter has come… It does sound like a title of a very popular tune but it concerns the reality. This winter has surprised everybody not only because it came so early but mainly because it was totally unexpected. Most of the city woke up and realized they were going to spend all their way to work drifting on every curve like in a well-known computer game. Fortunately there was no change in the “weather” for CodeTwo. Everybody arrived early, traditionally with disarming smiles, ready to sing Jingle Bells during a morning briefing. Apart from that, it was promising to be a typical day. 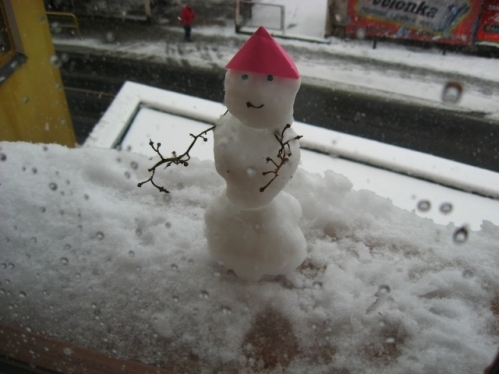 However, a very interesting creature, made of snow, grapevine stems and an unidentified matter, tapped on the window in the technical support room. We didn’t know what to do as it neither wanted food (even though there were some delicious pierogies in the fridge), nor it wanted money. Finally, we decided to give it our footer. I guess it liked it very much, ehh? 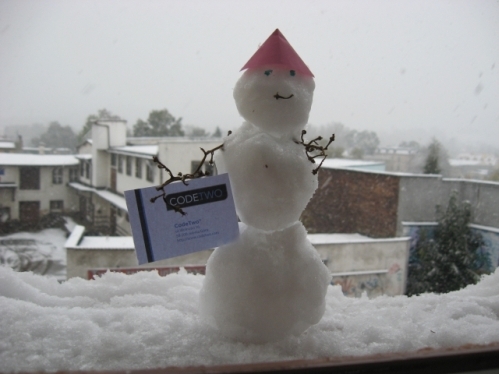 CodeTwo Snowman with CodeTwo footer - a perfect match! Yeah, winter is really early this year. Lack of winter tires starts to be more and more painful. And today morning I had to get rid of 500kg snow from my balcony. But forecast says that an Indian summer will be back.